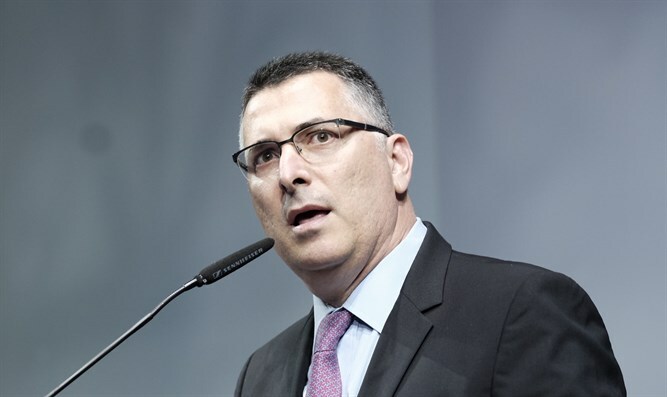 Former minister and political security cabinet member Gideon Sa'ar spoke to Arutz Sheva about a series of issues from Likud primaries to Benny Gantz's speech to Israeli policy in Judea and Samaria and the northern border. "I don't want to get into speculation because facts aren't known and the conjectures aren't helpful, but I want to express shock at the harsh images. I can't believe such things are happening here in the Land of Israel and I'm convinced the police will act decisively to locate and punish the criminals - sick souls infected with terrible hatred." As for Benny Gantz's speech, we asked Sa'ar if he did not find a connection between Gantz's There's no Left and no Right campaign and Meir Shitrit's statements when Kadima was founded, on striving for a party that has no "baggage" as he put it, of Jabotinsky or Katznelson. 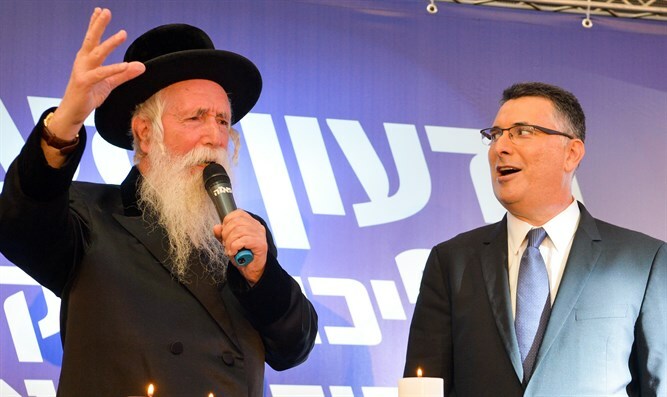 In Sa'ar's opinion, the statement that emerges from Gantz's campaign is more serious than Shitrit's statement: "Here we're told more than Shitrit's words, that there is no Right and no Left here; this is absurd, because there is a Right and there is a Left, there were always Left and Right and always there will be. Or he has no worldview or path but he wants to blur it, hide it, and mislead the voters. "Out of respect for Gantz's many years in the IDF uniform, I say it's good that people who want to contribute and have rich life experience come along, but the ideological path is very important. It's the most important thing. What's your way? Are you for or against establishing another Arab state? Are you in favor of strengthening settlement? What are your positions on the tradition of Israel? In these things there is Right and Left, and people have to choose between them after a penetrating clarification that must be conducted in respectful language," says Sa'ar, emphasizing that "in everyday life there are many ideological issues that require reference and decision." Perhaps, we asked, so much support for Gantz's party before he expressed himself indicates the desire of the general public to find leadership that's not clearly located on the Right or on the Left, but rather one whose statements are more obscure. Perhaps the general public is fed up with the struggles of the Right and the Left? Sa'ar replies: "The public is much more intelligent, the citizens want answers on social and economic issues, and the public has the right to hear answers to decide between the different paths, and I tell Ganz and his friends, do you have a path? Present it and let's argue." He believes the past experience of the Israeli public, which has been disappointed by leaders who have dulled down their position, will also be reflected in the upcoming vote at the polls. 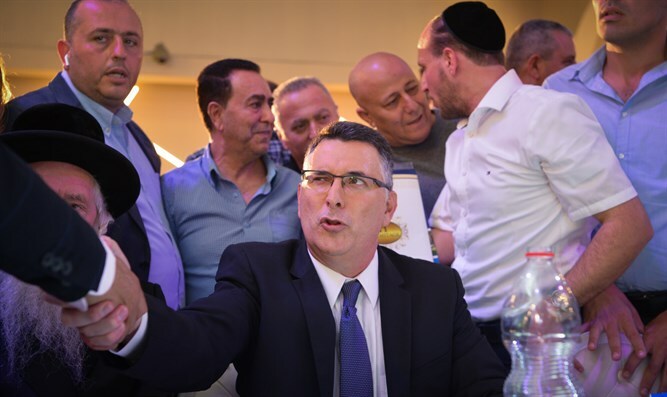 On reports that Gantz is expected to call the government of Israel in his speech a corrupt government that is dividing the people, Sa'ar was asked to take a stand: "He hasn't yet said what he has to say and I wouldn't like to address what hasn't yet been said. Even this refusal to relate to what hasn't yet been said is part of serious discourse. With this I think there's no room for collective accusations, which isn't right for any public." On the possibility that Gantz's might join Lapid, Sa'ar says it's quite possible such a union should bother the right-wing and the Likud less. Sa'ar estimates that a joint run will reveal some of Gantz's hidden positions. "The public knows better what Lapid's views on tradition and the Land of Israel are and doesn't know what Ganz's positions are. Joining would be to their disadvantage." From here, the conversation revolves around the political issue and assessments that after the US elections the American president will present his political plan and the right way to respond to this plan. Gideon Sa'ar also notes that seriousness requires hearing the plan and only then responding. "I have to say that I told American Ambassador David Friedman that I oppose establishing an Arab state in the heart of the Land of Israel, I believe this is dangerous and won't lead to peace. I hope this administration that is very friendly to Israel won't repeat mistakes made by previous administrations such as the Clinton and Obama administrations that presented guidelines based on establishment of a Palestinian state in Judea and Samaria. "I proposed alternative ideas that are regional arrangements based on existing states and not on establishing another Arab state in the heart of the Land of Israel," Sa'ar said. "Since thirty years ago, the Arabs of Judea and Samaria were Jordanian citizens and the one who deprived them of their citizenship is the Jordanian King," he said. "We can consider a connection between autonomy and Jordan." Sa'ar sees the dangers of a Palestinian state not only from the security aspect but also from the demographic point of view, since it has the ability to open its gates to absorb millions of Muslims. "This is a very dangerous scenario of loss of security and demographic control," Sa'ar says, noting that his position was clarified in his talks with the American Ambassador. "They tell us in a somewhat demagogic way, do you want a binational state? It's like giving a person a choice whether to commit suicide by strangulation or shooting. There's no need to commit suicide on a binational state or by establishing another Arab state. The Palestinian autonomous government may have a connection to Jordan within the framework of a regional arrangement. It cannot be that our enemies have security and demographic control over the territory." Sa'ar also rejected the idea of ​​a "state minus" that was heard in the past: "A lot of slogans are being thrown around. They say 'a state minus', which means a demilitarized state. I ask the same people: Is Gaza demilitarized after the Israeli withdrawal? The power building there that threatens Israel and its citizens only grows. We mustn't do anything like this in Judea and Samaria. If I'm elected as a public representative I will act to prevent such a danger and to implement the decision of the Likud Central Committee to impose Israeli sovereignty over Jewish settlement areas in Judea, Samaria, and the Jordan Valley. The issue of the Palestinian state in the Land of Israel should be removed from the agenda. It will not happen and we won't let it happen. Autonomy yes; a state, no. Even today they have autonomy where they control civilian and municipal life, but in the areas of security and demography, we cannot allow them independence." As a member of the security cabinet in the past, Gideon Sa'ar was asked about the policy of ambiguity that seems to have dissipated vis-à-vis the Syrian arena: "Not only do I have no problem with this, but I think it's correct, and I'll explain: There wasn't exactly ambiguity beforehand. It was clear that Israel was opposed to Iranian consolidation in Syria and was acting by means of attacks to prevent this establishment. Reality has changed. There was a long civil war and there was chaos, and there were Israeli military operations under the term 'battle between wars'. Today things have stabilized, the internal war has been decided, the survival of the Assad regime has been assured, and there's no question of who's working with the Iranian elements." In his opinion, canceling ambiguity is important because "Iran's trying to create capability for a qualitative strike on the Israeli home front from neighboring countries like Syria and Lebanon, because it's far from here and wants to hit any target in Israel from the front line. We cannot allow this and we must be determined to prevent it. Therefore I not only back the IDF operations under the government's guidance, but also think they should be intensified, because in a year's time conditions won't be better, and all the players must understand our determination on this issue. I believe the Russians will respect those who will be determined in this struggle." 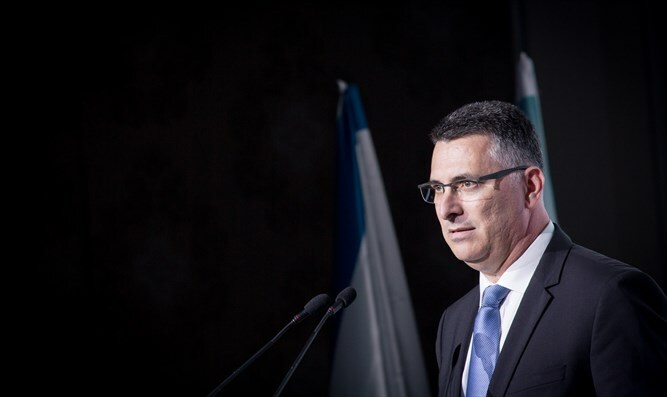 Toward the end of the conversation we asked Sa'ar about the internal struggle in the Likud, whether the tense feelings had already dissipated between the Netanyahu camp and the Sa'ar camp, which marked the beginning of his return to the political arena. Sa'ar replies: "There's no tension on my part, there's no division in the movement, we're all one camp that must ensure the victory of the Likud and the national camp headed by Prime Minister Netanyahu, and so I'll act in the future after the primaries are over. We'll face a battle that won't be easy because it's vital for the future of Israel that the right wing and the Likud at its center continue to lead Israel in the coming years." On one issue Saar refuses to speak absolutely, that is the issue of the ministry he wants to receive in the next government: "I don't talk about this, the bear hasn't yet been hunted, so there's no reason to divide up his hide," he says.